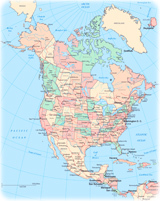 North America is one of the four parts of the American continent (the others are South America, Central America and the Caribbean (Latin America does not exist). It is composed by Canada (the second largest country in area in the world), U.S.A., Mexico, Greenland (Danish territory), The Bahamas, Saint Pierre and Miquelon islands (a small French overseas department ) and Bermuda (British dependency). The total population of the continent is about 460 million inhabitants. 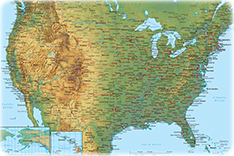 Economically, North America is one of the wealthiest regions of the world. It is also a place with many natural wonders such as Niagara Falls, the Grand Canyon and Rocky Mountains. The highest elevation is Mount McKinley with 6,194 meters, in Alaska. 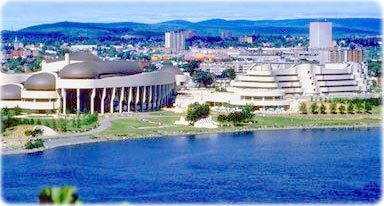 Museum of Civilization, in Hull, Québec. 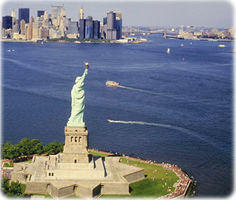 Copyright © Geographic Guide - New York City, Canada, Mexico. Gogledd America, Nordamerika, Meiriceá Thuaidh, Põh'a-Ameeriga..
San Francisco is a famous picturesque city of California. It has over 40 state-designated historical landmarks, including the Golden Gate Bridge, Telegraph Hill and Union Square. Golden Gate bridge on the San Francisco bay. United States.